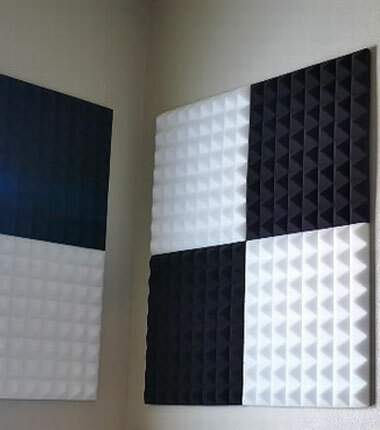 Envirotech is a leading Manufacturer of Acoustic Foam, Acoustic PU Foam & Anechoic Wedge/ pyramid foam Quality high sound absorption polyurethane foam. Having NRC of 0.8. This acoustic absorption foam is known for their fire retardant and sound absorption characteristics. Envirotech provides superior quality high sound absorption polyurethane foam (PU Foam) weakens the sound waves hitting it and minimizes the transmission of noise having NRC (Noise Reduction Co-efficient) value of 0.8. This acoustic absorption foam is known for their fire retardancy and sound absorption characteristics. These are widely used in hotel, ballroom, recording room, club, architectural decoration, industrial workshop, etc. This foam can be easily glued to any other material such as non-woven fabric, gypsum sheet, sun mica, glass fiber. Plain sheet size -1000mm x 2000mm and 25 / 50 mm thick sheets.